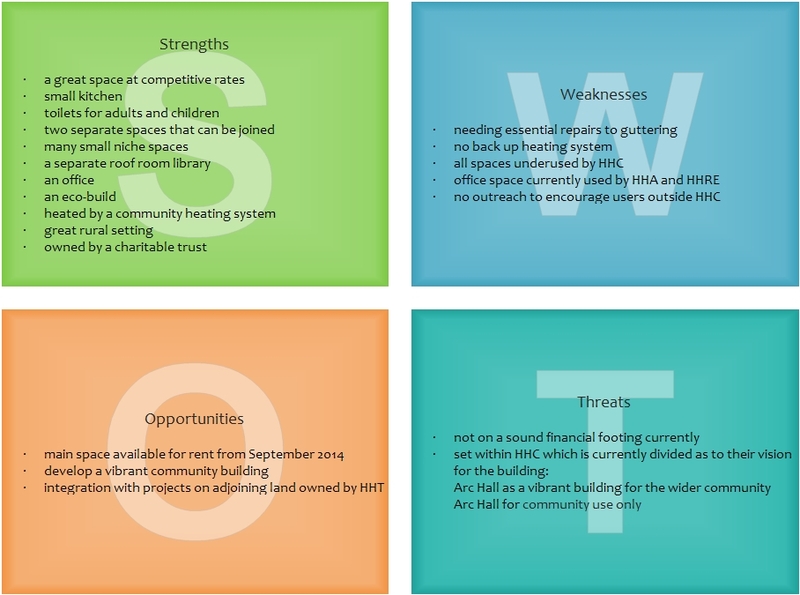 Hoathly Hill Trust, owner of the building, carried out a review at the end of 2013 (part of my Community Life Pathway), which resulted in a strategic plan for the organisation. Within that plan was a strategy for Arc Hall and the financing of Arc Hall. 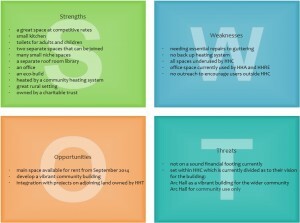 The board of trustees carried out a simple SWOT analysis as a foundation for the strategy based on their experience of managing the building for many years. apply for funding to develop Arc Hall as a community educational building. The short-term strategy for Arc Hall should be to break even on its income and expenditure accounts. The medium term strategy should be for Arc Hall to make a surplus on its income and expenditure accounts and begin repaying some of its borrowings to the General Fund. The long term strategy should be for Arc Hall to make a large enough surplus on its income and expenditure accounts to enable it to repay on an instalment basis it’s short-term and long term debts.